For 2018, a new SEL Sport Appearance Package adds unique 19-inch Magnetic-painted wheels, grille, mirror caps and rear spoiler; Mayan Gray fabric seats with Umber-colored Miko suede cloth perforated inserts; and custom embroidered Umber "Edge" floor mats to the Ford Edge SEL. 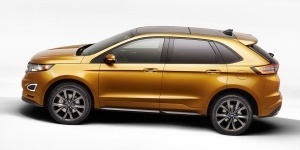 Get the best price for the Ford Edge of your choice from a dealer in your area. Request a price quote now.